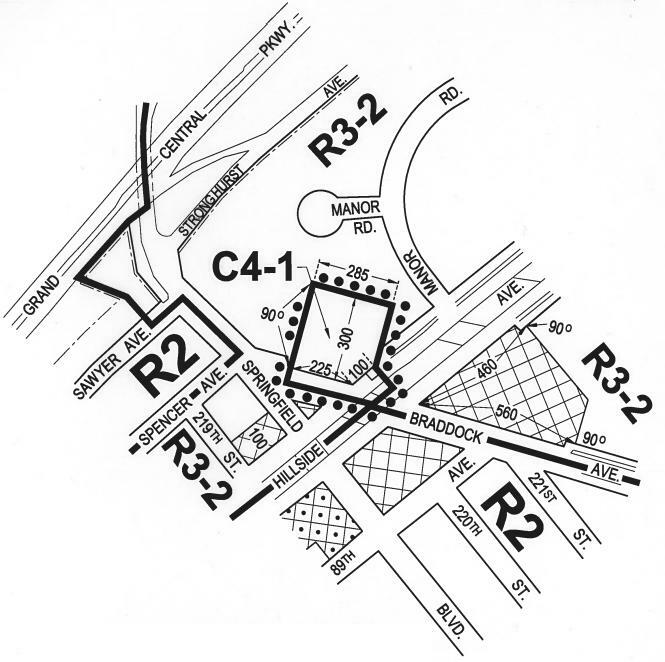 Map of the Braddock-Hillside Rezoning. Image Credit: CPC. City Planning Commission approved a zoning map amendment to facilitate broader commercial uses of the property.On March 5, 2014, the City Planning Commission unanimously approved an application submitted by DERP Associates, LLC, for a zoning map amendment to rezone to a C4-1 district a portion of an R3-2 district and an R3-2/C2-2 district, located at 220-05 Hillside Avenue in Queens. Currently at the site is a shopping center occupied by a Sears Appliance & Hardware Store, an HSBC Bank, and an AutoZone retail store. The rezoning would facilitate a wider range of commercial. The rezoning would also extend the district boundary line 25 feet to the west. This extension would remove reliance on a Board of Standards and Appeals special permit issued in 1991 which allowed nonconforming commercial uses at this location. The surrounding area is zoned with R2 and R3-2 districts, with C1-2 and C2-2 commercial overlays mapped along the major thoroughfares, including Hillside Avenue. Immediately west to the area to be rezoned is the Grand Central Parkway. Immediately north of the rezoning area is a two-story garden apartment cooperative development known as Bell Park Manor Terrace, comprised of 50 residential buildings and 850 apartments on 47 acres of property. The thoroughfares to the south and east of the rezoning area are predominately developed with single-story food establishments, such as Taco Bell and Pizza Hut. Queens Community Board 13 held a public hearing on December 16, 2013, and adopted a resolution recommending approval of the application. Queens Borough President Melinda Katz issued a recommendation approving the application on January 21, 2014. Update (4/3/2014): On April 1, 2014, the City Council Land Use Subcommittee on Zoning and Franchises heard the application. Council Member Mark Weprin stated that the rezoning site, which is located fairly close to where he lives, was an empty lot before the shopping complex was built in 1997 and “an area that the community hated.” Council Member Weprin said that the “community is very happy that this opens up options for what kind of stores” can lease the site. The subcommittee voted 9-0 to approve the application the same day. The full Land Use Committee approved the re-zoning on April 3, 2014. CPC: Braddock-Hillside Rezoning (C 140037 ZMQ – Zoning map amendment) (March 5, 2014).